This is an OPEN EDITION reproduction of Newport in Pembrokeshire presented by Vlad-Art from an original painting (24” x 20”) created in oil by Welsh based artist Vladislas. 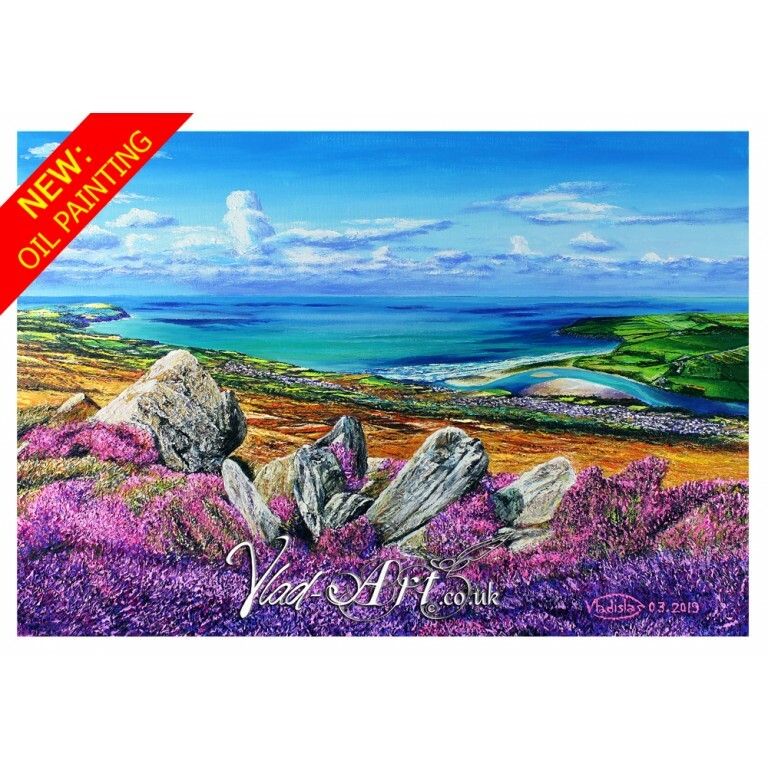 This incomparable view of this little welsh seaside town and coastline has been stamped with Vladislas unique passionate brushwork for bright light and vivid colours of natural wonders of the British landscapes. Newport is a quiet little town and ancient port of Parrog in remote West Wales at the mouth of the River Parrog in the Pembrokeshire Coast Path and National Coast Park. It is popular for walks in the Preseli Hills between Carn Ingli, an Iron Age hillfort with Bronze Age hut circles standing as a lone sentry just above Newport, and nearby Carreg Coetan, accredited to be Arthur’s burial chamber. The Preseli Hills have long been the focus of human activity from prehistoric times to the present day. Carn Ingli itself, translated as "the rocky summit of the angels”, is sitting at 347 metres above Newport and is very special to local welsh folks as it holds a lot of spiritual ancestry. Indeed, it is said that some stones now standing in Stonehenge site come comes from Carn Ingli. This is an OPEN EDITION reproduction produced as the original, on canvas, to the highest print quality, comes with a certificate of authenticity and inclusive of FREE fully tracked delivery in the UK. Vladislas open edition prints depict scenes from around the UK and British Isles in various sizes and made available for sale as fine art quality prints closely reproduced from the original on an outstanding, professionally treated acid-free, water resistant textured fine art paper and printed with the highest museum archival quality giclée standards. Buying an open edition oil painting reproduction from Vlad-Art couldn't be easier, just add your chosen canvas print to your basket and follow the easy on-screen instructions to checkout. Your fine art canvas print will be dispatched in secure packaging.